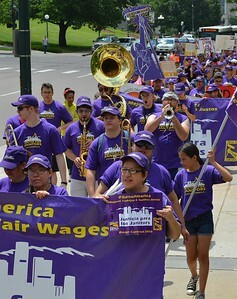 Janitors in Denver Colorado, calling for a $15/hr wage, rallied at the state capitol then marched through downtown. 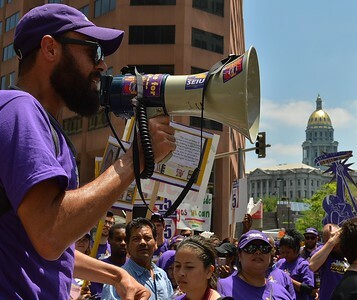 The protest was organized by SEIU Local 105, which represents janitors that work in downtown Denver office buildings. 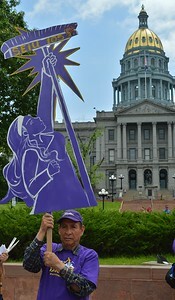 Man speaking through bullhorn to group of Justice For Janitors protesters, Colorado State Capitol dome in the background. 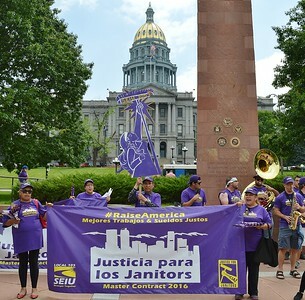 Two union women holding Spanish language "Justice For Janitors" banner in front of Colorado State Capitol building, other union members stand behind banner. Union janitor holds sign depicting woman janitor holding broom up in the air, SEIU 105 written on broom. 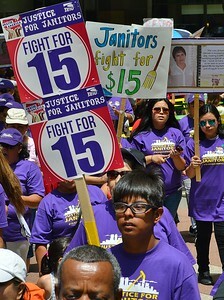 Young boy carries sign that reads "Fight For $15", other marchers with sign in background. 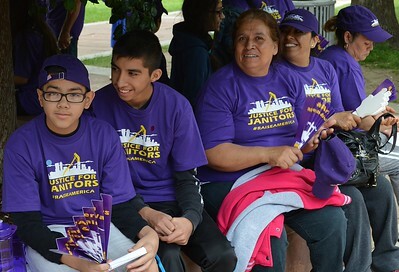 Two young boys and group of women wearing "Justice For Janitors" shirts sitting on a bench. 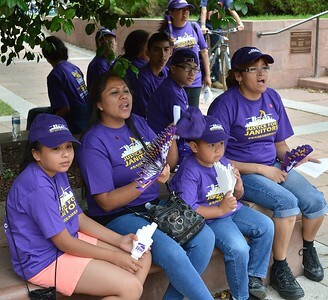 Two hispanic women sitting with 2 children and chanting, all wearing "Justice For Janitors" t-shirts. Group of demonstrators at Justice For Janitors rally raising hand in the air and shouting. 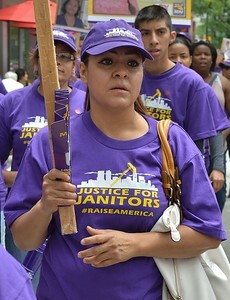 Woman wearing Justice For Janitors shirt and carrying sign. 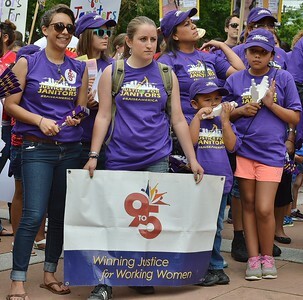 Young woman holding banner "9 to 5, Winning Justice For Working Women", other demonstrators behind her, all wearing Justice For Janitors t-shirts. 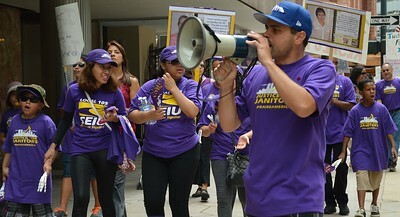 Man marching with sign depicting woman janitor holding broom in the air with SEIU N105 on it, other janitors march with him. 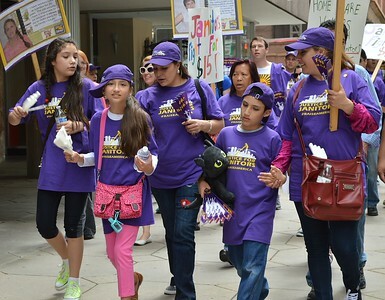 Two women and three young girls, all wearing Justice for Janitors t-shirts marching together, one girl has hat on sideways, other protesters behind them. Group of musicians playing instruments while marching, others marching with them, all wearing Justice For Janitors shirts. 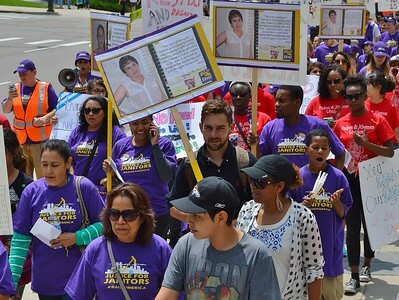 Group of protesters in Justice For Janitors march, some carrying signs. 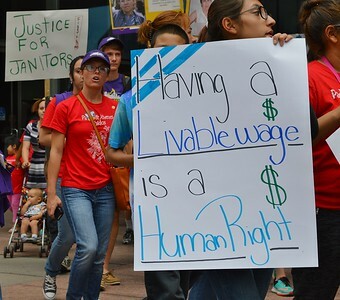 Young woman carries sign about livable wage and human rights, other marchers with signs behind her. 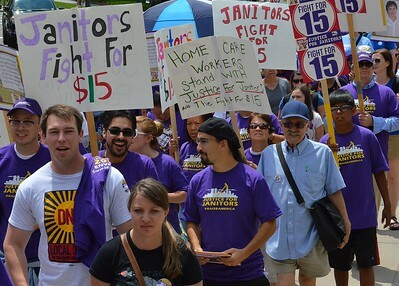 Group of protesters in Justice For Janitors march, some carrying signs that say "Fight For $15". 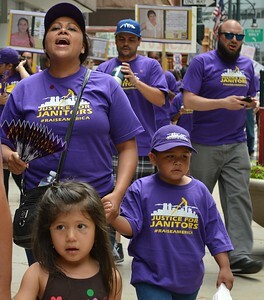 Mother and young son marching in Justice for Janitors march, young girl in front of them. Man speaking into bullhorn, marchers wearing SEIU 105 shirts in background. 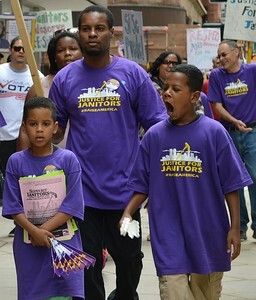 Young African-American man and two young sons, all wearing Justice For Janitors shirts marching, other protesters in background. 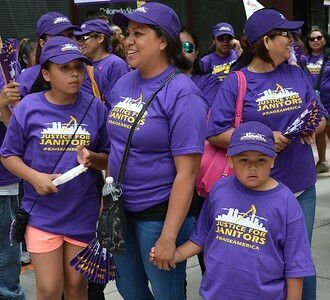 Two women lean towards each other to talk, young girl behind them, all wearing "Justice For Janitors" t-shirts. 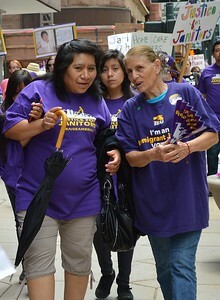 Woman standing with her two children, all wearing Justice For Janitors t-shirts, other demonstrators in background. 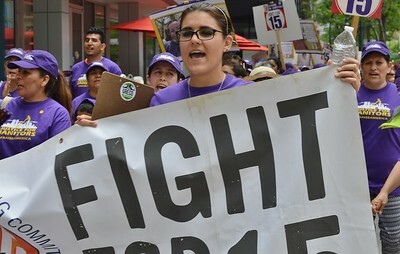 Young woman holding large banner with word "fight" on it, other marchers behind her. 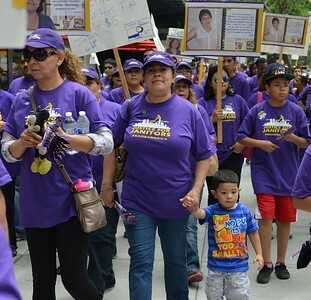 Woman holding hand of young son while marching in Justice for Janitors protest, large crowd of marchers behind them with signs. 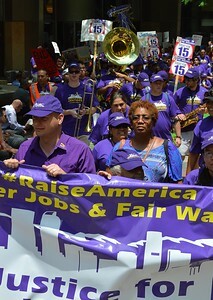 African American woman marching behind large banner, other demonstrators in the background. Man seated in outdoor restaurant "high fives" Justice For Janitors" marcher as she and other go by. 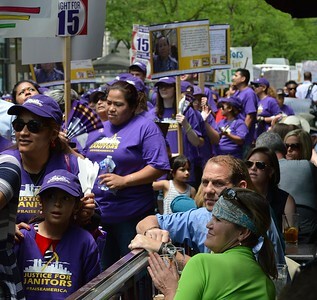 Restaurant patrons turn to watch as "Justice For Janitors" marchers go by.